Manchester City are 1-0 up against Leicester at half-time in their Premier League clash, thanks to a Gabriel Jesus goal moments before the interval. City had to overcome adversity, with Leicester fired up and working hard in front of their home fans, and City losing key man John Stones to a hamstring injury. 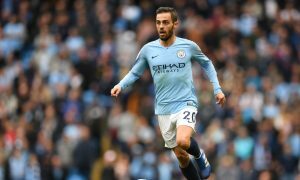 It took a most exquisite team move to unlock the Foxes defence as Raheem Sterling burst into action before David Silva squared the ball for the previously quiet Gabriel Jesus to tap in.